On October 5, 2018, President Trump signed the Federal Aviation Administration Reauthorization Act of 2018. This bill (H.R. 302), which reauthorized the Federal Aviation Administration (FAA) and other programs through 2023, also contains several important provisions to improve travel for people with disabilities. According to the Census Bureau, about one in five Americans has some kind of disability, and one in ten has a severe disability. 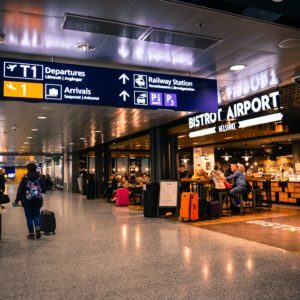 The U.S. Department of Transportation reports that there were 764 million flyers in the 12-month period ending in July 2018. One can safely assume that millions of these passengers are disabled. In this issue of The ElderCounselor, we will look at who was behind this law, problems those with a disability face when flying, and what new measures are in the law. Who Was Behind This Law? H.R. 302 includes several provisions similar to those in the Air Carrier Access Amendments Act that was introduced by Representative Jim Langevin (D-RI) earlier this year and by Senator Tammy Baldwin (D-Wisconsin) in 2017. Representative Langevin, who co-chairs the Bipartisan Disabilities Caucus, is a quadriplegic and has encountered problems in his own flying experiences. The Paralyzed Veterans of America (PVA) and The National Multiple Sclerosis Society worked with Representative Langevin and Senator Baldwin, and have been advocates for changes that will benefit the broader disability community. According to PVA, the top complaint they receive from members is related to problems with air travel. Members of PVA supported increased civil penalties for wheelchair damage or bodily harm and a study on the feasibility of in-cabin wheelchair restraint systems. Paralyzed Veterans of America is the only Congressionally-chartered Veterans service organization dedicated solely for the benefit and representation of Veterans with spinal cord injury or disease. For more than 70 years, the organization has helped disabled Veterans with the benefits, medical services, jobs, research and rehabilitation they need to get on the road to recovery and regain their freedom and independence. The PVA ensures they receive the benefits they have earned through service to our nation; monitors their care in VA spinal cord injury units, and funds research and education in the search for a cure and improved care for individuals with paralysis. Multiple Sclerosis (MS) affects more than 2.3 million people worldwide. It is an unpredictable, often disabling disease of the central nervous system that disrupts the flow of information within the brain, and between the brain and body. Symptoms range from numbness and tingling to blindness and paralysis. Most people with MS are diagnosed between the ages of 20 and 50, with at least two to three times more women than men being diagnosed with the disease.